Rather than purely causing discomfort, standard keyboards can be unusable for some people with neurological and physical disabilities such as dyslexia. Our range of specialist ergonomic keyboards are designed to assist with a variety of disabilities, enabling all individuals to work in a computer-based role. 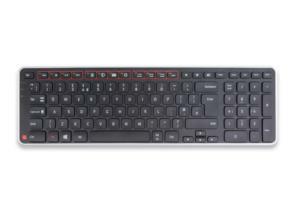 Left Handed Keyboard - The integrated number pad is positioned on the left hand side to enable the mouse to be positioned close to the user on the right hand side of the keyboard. 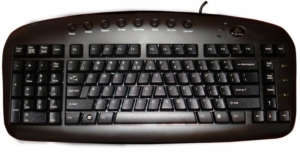 Large Print Keyboard - Ideal for individuals with visual impairment due to the yellow upper case text providing high contrast and improved visibility. Monster Large Key Keyboard - Perfect for individuals suffering with dyslexia due to the colour coding of vowels, numbers etc. Double sized keys are also perfect for inidviduals that struggle to locate keys on a standard keyboard and for early learners. Maltron Keyboards - These have been ergonomically designed and shaped to fit the easy movements of hands, fingers and thumbs. Available as a dual handed and a single handed keyboard, they are ideal for amputees also. Flexible Comfort Keyboard - Ideal for portable workers as they fold and roll up. Water resistance makes them ideal in laboratory environments. Order a specialist ergonomic keyboard today!